Local EAA chapter President Tim LoDolce and George Grupe browse through military history. 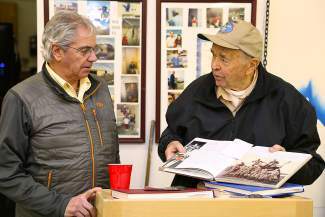 TAHOE/TRUCKEE, Calif. — George Grupe, a World War II B24 Liberator pilot and military historian was guest speaker at the Experimental Aircraft Association Truckee Tahoe Chapter 1073 general membership meeting. Grupe, a 92-year-old EAA member, reminisced about his experience as a young cadet in 1942, on Tuesday, March 11. Grupe has amassed a large collection of memorabilia regarding WWII and continues to honor fellow veterans as a guest speaker. According to http://www.eaa1073.org, the Experimental Aircraft Association (EAA) is an organization of members with a wide range of aviation interests and backgrounds, dedicated to preserving flying of any kind. Since its founding in 1953 by people interested in building their own airplanes, the organization has expanded its mission to include antiques, classics, warbirds, aerobatic aircraft, ultralights, helicopters, and contemporary manufactured aircraft. EAA Chapter 1073 is based at the EAA 1073 hangar, Truckee-Tahoe Airport. The Truckee Tahoe AirShow & Family Festival to be held July 11 will benefit EAA Chapter 1073, KidZone Museum and the Truckee Optimist Club. Visit truckeetahoeairshow.com.